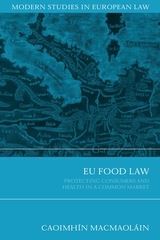 This book provides a broad conspectus on the application of EU and international regulation of the food sector on English law. It is aimed at practitioners and students of this vital and emerging branch of law, which has become an important part of current political and legal debate. It is written not just for lawyers as a statement of current law, but is also aimed at all those involved or interested in the food industry who wish to familiarise themselves with how the law is applied practically in this jurisdiction. The book commences with a short conceptual framework for the study of food law. It then provides a comprehensive and up-to-date account of current English law, explaining fully the detailed processes by which both international and national law and EU decision making have impacted upon most aspects of the production, sale and consumption of food in England. The book explains and assesses the operation of the current law by describing in detail the roles of Government, the Food Standards Agency and local enforcement authorities in the making and enforcing of laws concerning food. 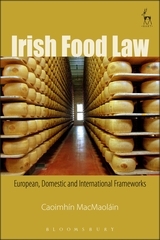 The work contains full outlines of the developments in the most significant areas of food law. It concentrates specifically on topics such as food labelling and advertising, quality and compositional requirements, geographical food names, genetic modification, organic production, animal welfare and also the role of law in tackling poor health, obesity, and diet-related disease. The book, though primarily designed as a law text, goes beyond the usual confines of such works. It sets out to explain and describe the impact of successive food crises, such as BSE and the use of horsemeat in beef products, on food safety and transparency requirements. 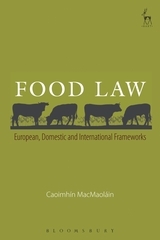 The book considers and assesses how the existing rules on the chemical and biological safety of food impact on our law, and concludes with a review of the developing legal issues concerning the environmental impacts of current and proposed food law, in particular the relationship between food law, climate change and food security. Caoimhín MacMaoláin is an Associate Professor of Law and Fellow at Trinity College, Dublin.